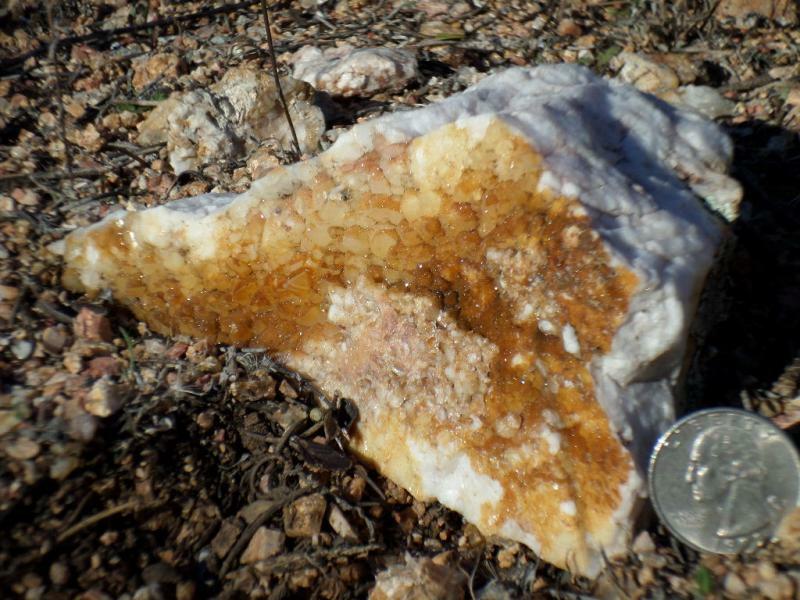 THe wife and I were out last weekend ,12ish miles NNW of Rich HIll,AZ and found a purty rock about 4 "x7" and couple inches thick. Found others of interest but not as purty.. BRought back 200 pounds or so of 'em. Lots of large feldspar phenocrysts or porphyroblasts . to throw out some bit words I found on WIKI. 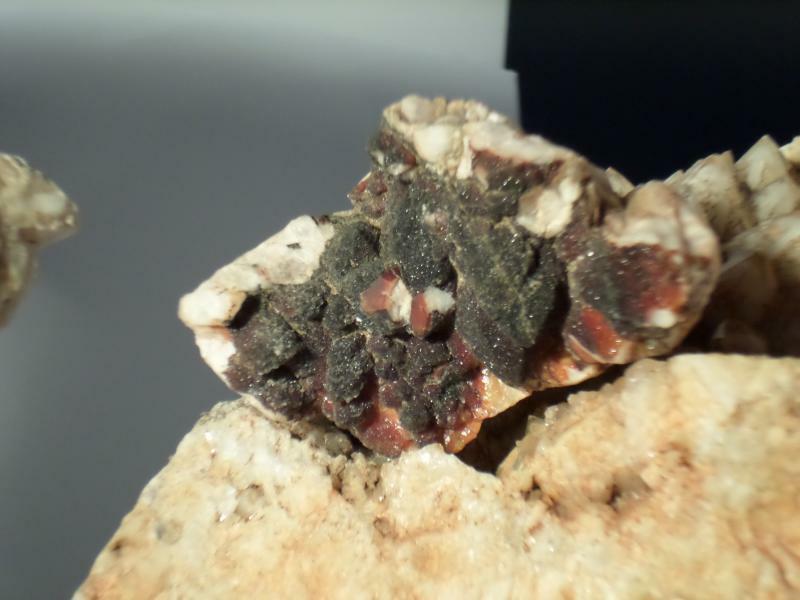 - one side of it is faced with quartz crystal that looks like it was hit with some secondary hydrothermal erosion/depostion that's amber/brownish. Sortof melted the crystals down a bit so the terminations are few . Below the crystals (moving outward from the pocket) colors range the gamut with some purply redish black eye candy. 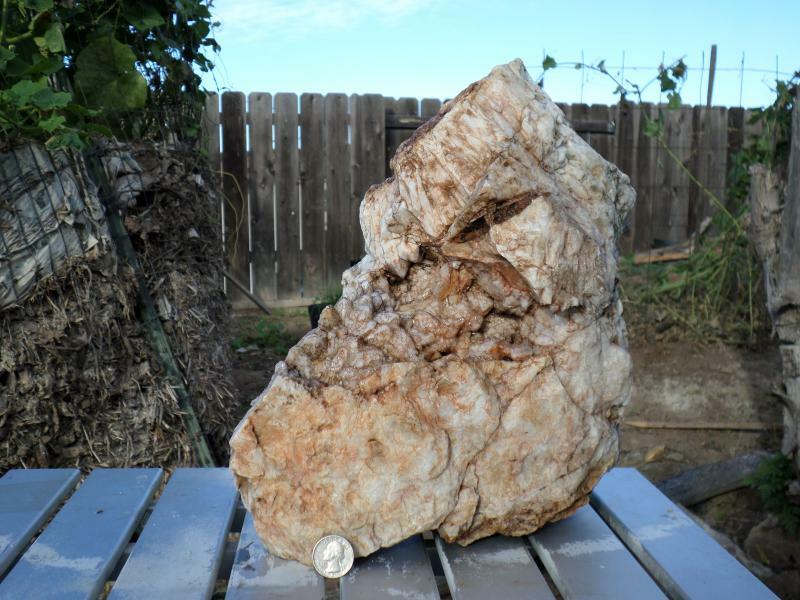 It's been in that for a day and not a bubble from the surface/ hint of reaction or change surface coloration or shape..
Mike's seen a purty rock or two out there,,,.. If you need any help posting the photos let me know. Yup ... 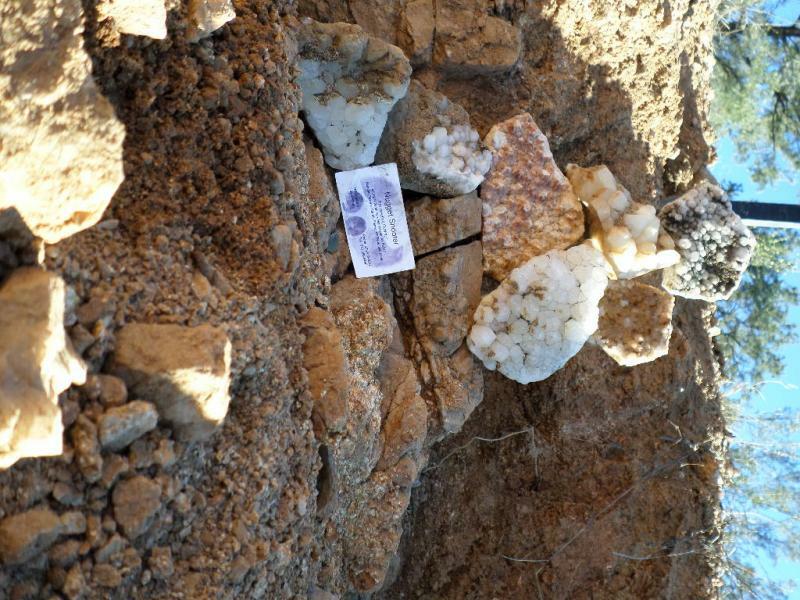 There is some unusual crystalline structures up on that hill side. 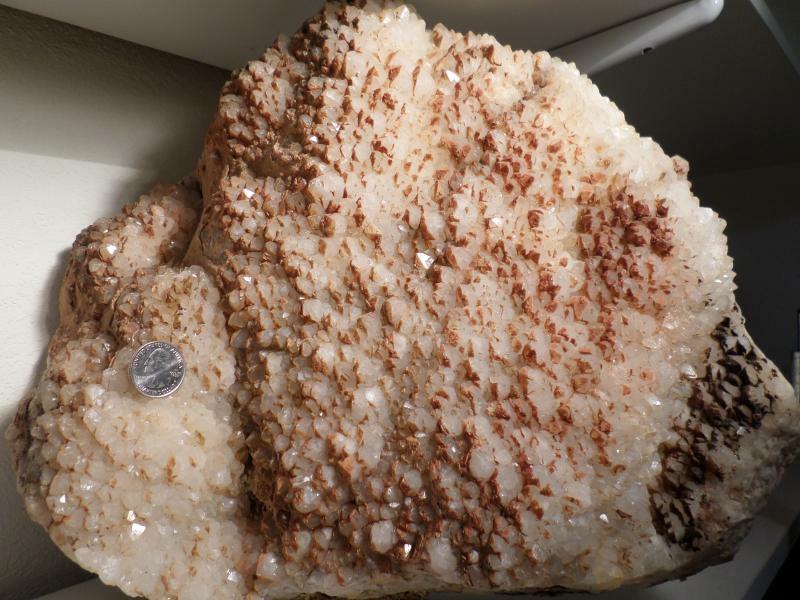 Was there with WH and wife a year or so ago and found quite a few quartz like crystals on a base not unsimilar to caliche ... different than what I think WH is talking about now..
Hey, Mike,,, the sample I'm describing is just a bigger/thicker rock than the one you gave your girl. If "metal prep"( weak phosphoric acid $17/gal@HOme Cheepo) doesn't touch it, will CLR? 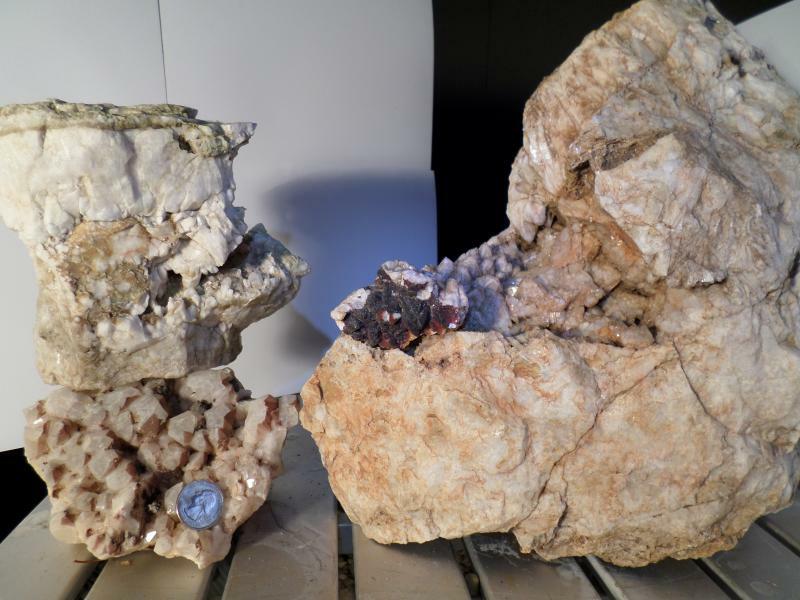 Both react with alkaline earths/foam up when reacting with scale. I heartily agree a picture or two is needed , and will be acquired of this shinylicious baublite. Reputed pH of lemon juice is 3, if I recall correctly... My mouth pucker meter measures a little more acid than that ..
COUld the lemon juice have some overall effect on the general feldspar matrix of this rock or the surface appearance of the quartz crystals ---even though the phosphoric acid( metal prep) and the CLR had none apparent? Well I made lemonade instead of wasting it on the baubleite.... cant find the camera charging cable and have resigned myself to driving back for more bauble in the near future . 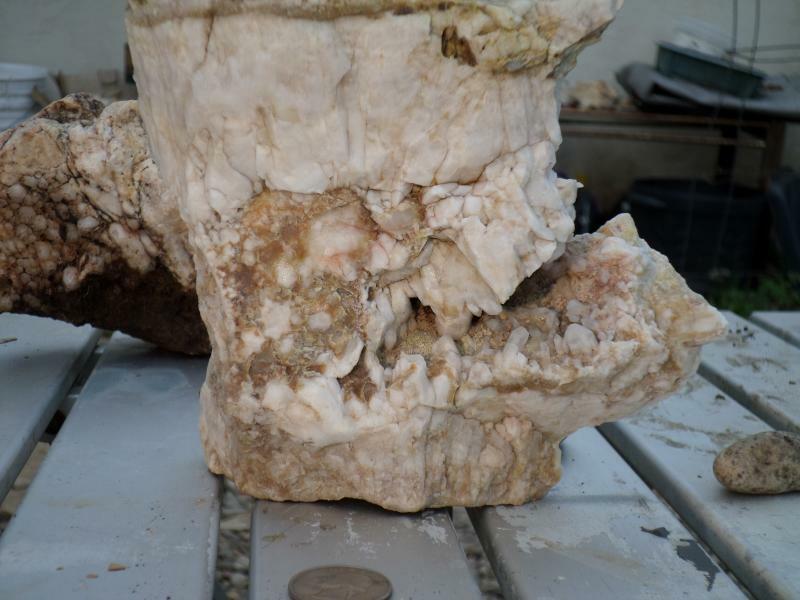 I was wondering if there might be anyone that could slab it in the greater WIckenburg/ Morristown area? Well that narrows it down ?????? I took the "wheel chock" to a local large jeweler who can slab it.. He turned down my business because he thought it would be better off left as is; thought it might fracture when slabbed if the country rock wasn't firmly attached to the crystal face, though, to me, it looks quite solid all the way through it's depth. 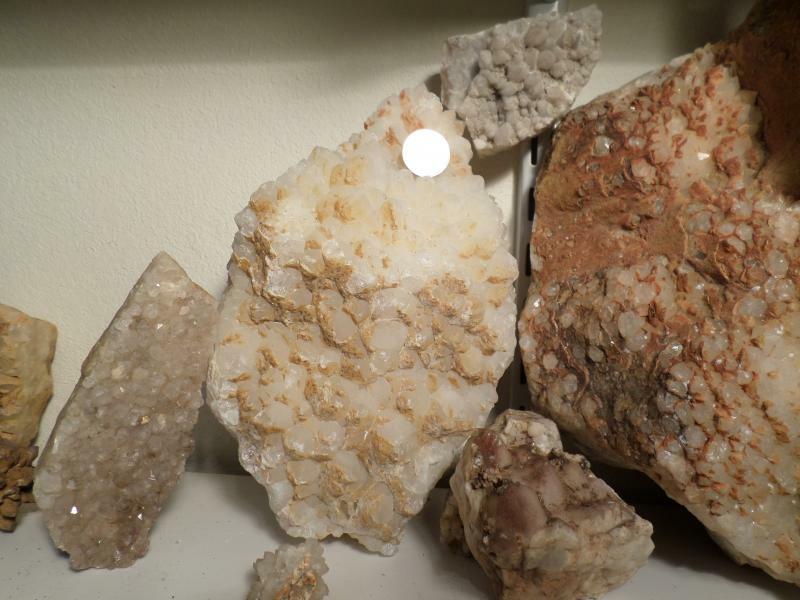 I am told by the professional gem and mineral exhibitors, that the best substance for cleaning specimens is Oxalic Acid. A guy I used to buy "Perky Boxes" from for small meteorites, recommended it. He said you can make it as strong or weak as needed. Yes, I agree, as most everyone I have asked has passed on the same advice. One cautioned me not to use it too concentrated. I caught myself before making a big mistake- I found a product marketed by WHinK labeled RUST STAIN REMOVER. MIght clean off my baubleite goo. AS I read the label, I understood it to be quite poisonous. THE MSDS on their website states the product contents as hydrofluoric acid 7664-39-3 at 1.5 - 3.5% by weight with water being 90-100%(huh?) by weight. 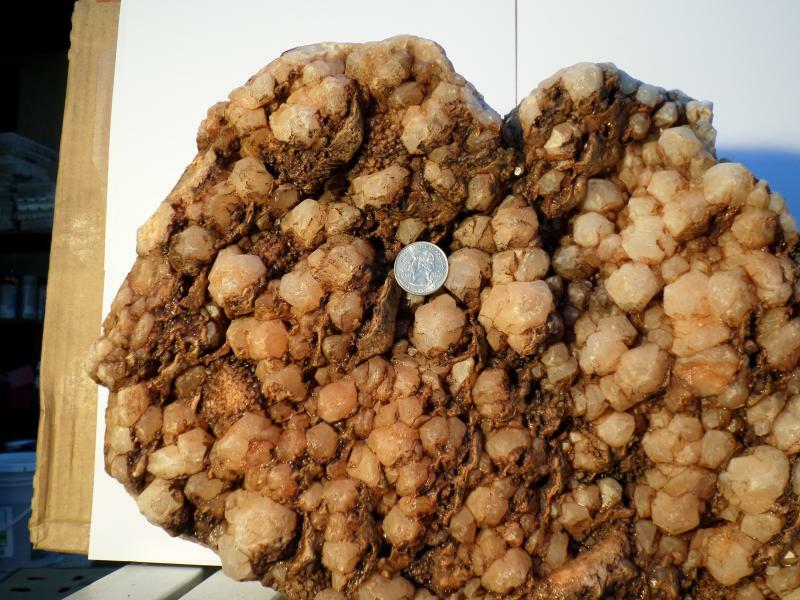 I found a 12" by 16" critter two days ago- one side of which is covered in quartz crystals. THe wife thought a snake had got me when I whooped. I keep imagining a "wet wall" in my future desert oasis- the wall built with the same baubleite found onsite. A slow water feed from the top edge humidifies and cools the interior at same time. DOn't trouble yourself, El D, as I am on the verge of discovery. In the mean time, I am getting some og the bauble into the first stages of cleaning. Ain't touchin the biggun 'til I learn a thing or 2. 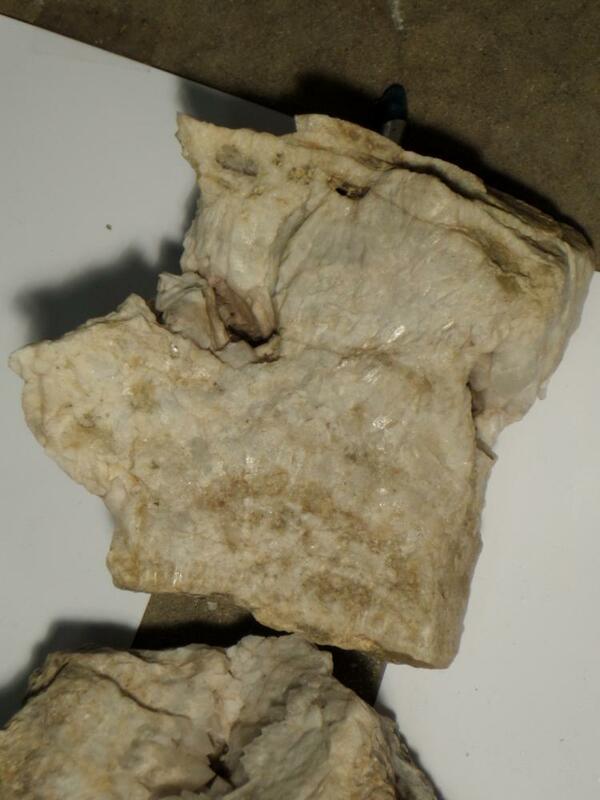 >>>>>>>>>>strong oxalic acid solutions reacting with this rock smell like vinegar. THe smell had me curious, so I googled.. I swear it smelled like strong vinegar. DOn't worry- not in the habit of breathing this stuff- it's all outside and covered up to keep the bees out of it. The dissolution of pure iron oxides by organic acids has been extensively reviewed. The ... as oxalic, citric, ascorbic, acetic, fumaric and tartaric acid, have been ..."
I guess the topic should be changed to "what am I going to do with these rocks"? Tabletop rockwaterfalls to sooth your karmic disarray?